I think most people will say they want to have a place of their own. I count myself among that group, though I have also said that I never want to buy land because of property taxes. I also love to travel. Some people have combined their home with their ability to travel and bought RV’s or other portable living spaces, and the idea has always fascinated me. I’ve also been interested in tiny-homes (houses less than 1,000 square feet) for several years. Recently, I had the opportunity to purchase a GMC 3500 Cutaway, aka mini-bus. I have lovingly dubbed this vehicle the “not-a-bus” as bus is, apparently, a legal term for an automobile that has the capacity to seat 16 or more passengers plus a driver. At the time of purchase, the not-a-bus only had seating for 14 passengers plus a driver, which also had the added benefit of meaning that a CDL was not required. 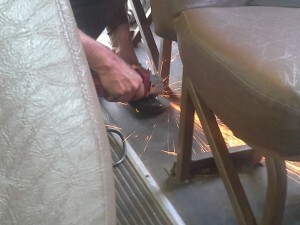 With the help of a local handyman, who worked for tools and food, I was able to get most of the seats ripped out. I left one seat, plus the driver seat intact. 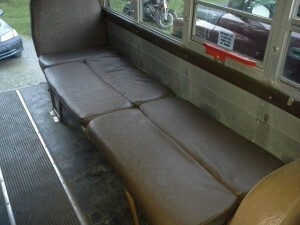 The one seat in the back that was left intact, is attached to a heater, and is also serving as the headrest for the bed that was fashioned from the frames of four of the seats that were removed. 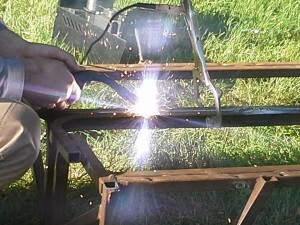 In all, it took about 20 hours for two people working in tandem, to remove six of the seats; cut, grind and weld four of the seat frames together into a bed frame, and re-install one seat in a rear-facing position. Four of the seat cushions were placed back into the seat frames to make the mattress for the bed. A mattress topper was put on top of that to smooth out the seams. Wire was run above the windows, and curtains made out of pillowcases and bed sheets. 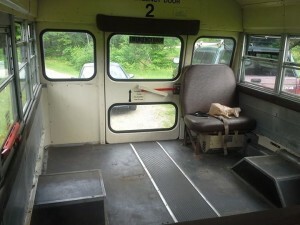 Two more pieces of wire were run behind the steps and driver seat, and fleece blankets were hung to allow the back of the not-a-bus to be closed off from outside viewing. The next thing that I want done is to get screen put up around some of the windows, so that I can sleep with a window open and not have to worry about bugs getting into the sleeping area. I am still trying to figure out what to do about a kitchen and bathroom; though, the plan is to ultimately have the not-a-bus become my own tiny portable house with wind and/or solar power to keep my laptop and cell phone charged. And, if one geographic area becomes too oppressive or boring, I can always take my house somewhere else! I hate to be all like Kanye here… but I have the best RV (down by the river, no not really) on HoT. Sorry, I’m not posting pictures. Let’s just say they are lots of fun until the weather turns cold.